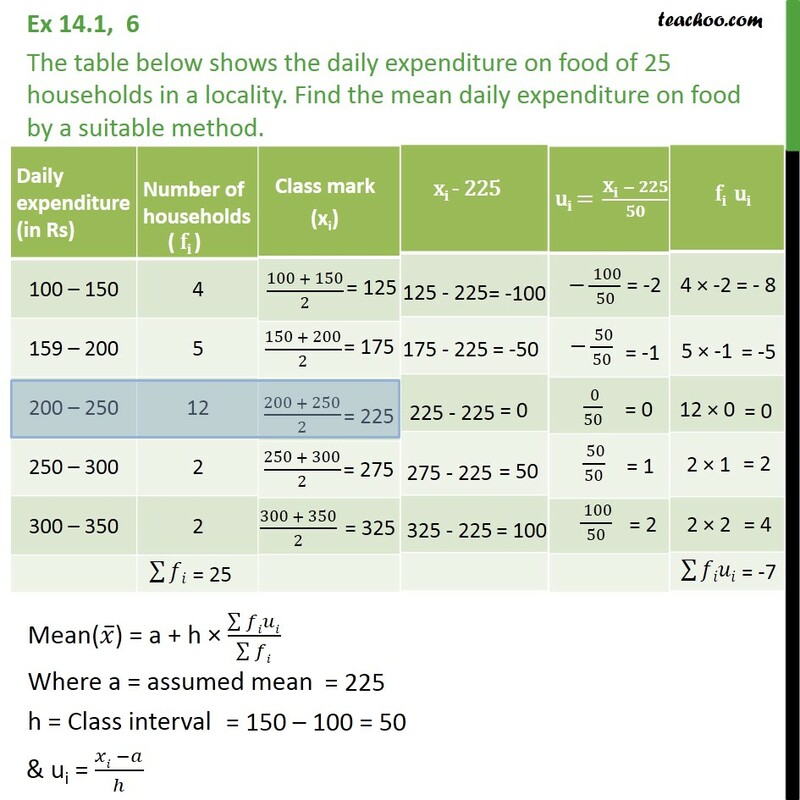 Ex 14.1, 6 The table below shows the daily expenditure on food of 25 households in a locality. 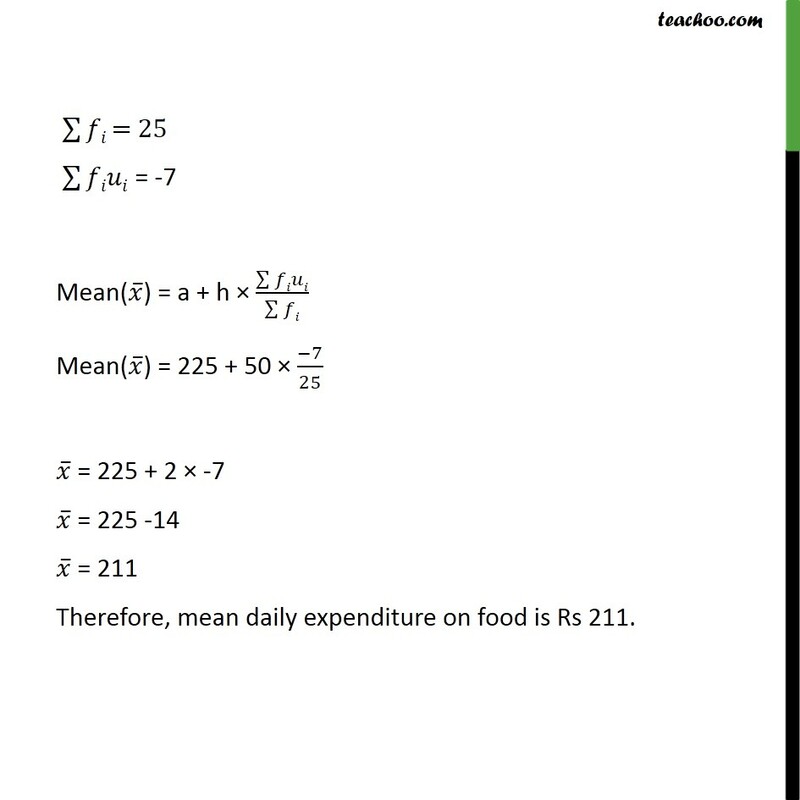 Find the mean daily expenditure on food by a suitable method. Daily expenditure (in Rs)	Number of households 100 – 150	4 159 – 200	5 200 – 250	12 250 – 300	2 300 – 350	2 Class mark (xi) (100 + 150)/2=125 (150 + 200)/2=175 (200 + 250)/2=225 (250 + 300)/2=275 (300 + 350)/2=100 125 - 225=100 175 - 225=50 225 - 225=0 275 - 225=100 325 - 225=50 −( 100)/50 = = -2 −( 50)/50 = -1 ( 0)/50 =0 ( 50)/50 =1 ( 100)/50=2 4 × -2= - 8 5 × -1=-5 12 × 0=0 2 × 1=2 2 × 2=4 ∑▒𝑓𝑖𝑢𝑖=-7 Mean(𝑥 ̅) = a + h × (∑▒𝑓𝑖𝑢𝑖)/(∑▒𝑓𝑖) Where a = assumed mean= 225 h = Class interval = 150 – 100 = 50 = 150 – 100 = 50 & ui = (𝑥𝑖 −𝑎)/ℎ ∑▒𝑓𝑖 = 25 ∑▒𝑓𝑖𝑢𝑖 = -7 Mean(𝑥 ̅) = a + h × (∑▒𝑓𝑖𝑢𝑖)/(∑▒𝑓𝑖) Mean(𝑥 ̅) = 225 + 50 × (−7)/25 𝑥 ̅ = 225 + 2 × -7 𝑥 ̅ = 225 -14 𝑥 ̅ = 211 Therefore, mean daily expenditure on food is Rs 211.